A perfect haven of comfort and grace, Classic Avenue Hotel at Thampanoor, Thiruvananthapuram embraces all possible solutions for work and relaxation amidst opulence and grandeur for the comfort seekers as well as the talented professionals in Thiruvananthapuram, the hotel being one of the leading 4-star properties in the hospitality sector nearby the vibrant city life. Classic Avenue Hotel in Thiruvananthapuram is positioned favourably within reachable distance from KSRTC Bus Station in Thampanoor, Thiruvananthapuram Central Railway Station, Thiruvananthapuram International Airport and all the top tourist attractions and leading business centres situated across the town. 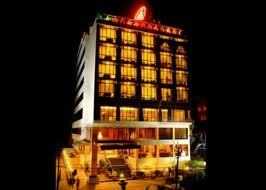 Located within easy reach of the Thiruvananthapuram Central Railway Station, Classic Avenue Hotel caters to the discerning needs of the leisure travellers as well as the qualified professionals with various exclusive comforts and conveniences, which include modern gymnasium, coffee shop, multi-cuisine restaurant, swimming pool, conference room and banquet hall. The hospitable and courteous solutions offered by the amiable staff are ideal for making the stay interesting as well as peaceful for all who opt for accommodation in Classic Avenue Hotel of Thiruvananthapuram. The space of 231 sq. ft occupied by the charmingly arranged Executive Rooms feature smart twin beds, free wireless internet usage and warm and adorning wooden flooring. 231 sq. ft of area at the Club Rooms contain all the comforts that are appointed at the Executive Rooms with a separate dressing space adjoined with the bedroom, which has a comfortable king-size bed, free wireless internet usage and a dedicated work desk. 212 sq. ft. Classic Rooms are connected with a door placed in between the rooms, which feature twin or king-size beds. The stylishly-embellished Suites, spread over an area of 346 sq. ft. across the 4th level, 5th level, 6th level and 7th level, comprise of an aesthetically appointed living zone with luxuries like LCD television, in-room small refrigerator, electric kettle, coffee table, dining table, in-room safe, 2G/3G internet connection, a luxurious bedroom, a spacious 62 sq. ft. bathing area with a large bathtub and an attached washroom. Classic Café – Welcomingly appointed coffee shop, a perfect venue for snacking and chatting. Cheers – The plush and trendy bar that serves some of the finest cocktails and wines in the town. Accommodating around 250 guests at a time during banquets and meetings, Classic Avenue provides its guests with all sorts of convenience including the hi-tech audio-visual units for conferencing and partying. The rooftop swimming pool is an on-site attraction worth exploring whereas the contemporary fitness equipments at the state-of-the-art are worth exploring.